Looking for the “real” UK? The phone rang about an hour after I’d completed my online order. The woman on the other end – northern accent, friendly tone – sounded a little anxious. Had I just booked a ticket for a play at the New Vic Theatre? Yes, I said, I certainly had. “You do know we’re in Newcastle-Under-Lyme,” she said. I started to laugh. Yes, I knew. In fact I was just planning the train journey when she phoned. She sounded relieved. “Oh good, it’s just that we always check when someone with a London address books a ticket. You’d be surprised how many people don’t realise where we are. They think they’re booking one of those theatres in London with a similar name”. It was an exchange that in its own small way summed up what’s been bothering me for years: The gaping chasm not just in wealth and opportunity, but in understanding between London and the rest of the UK, particularly the north. “Londonitis” is what Neil O’Brien of Policy Exchange called it in a recent piece for The Spectator. He argued that economically and socially “the capital now has little in common with the rest of Britain”. That’s true for incomes, house prices, rents, higher education. You name it, we’re in a league of our own. Or at least, those of us with good jobs and a solid roof over our heads are. London produces a fifth of the UK’s total GDP, and you’ll find the nation’s richest households here. The capital’s unemployment rate is one of the highest in the country and London’s also home to the three areas with England’s highest levels of income deprivation. But it’s the high-end that drives the national conversation. Westminster and the City exert an irresistible gravitational pull on the media and on politicians (not to mention on Russian Oligarchs) because they dominate national politics and finance. Deputy Prime Minister Nick Clegg once promised reform. “We are now” he said, “the most centralised country in Europe bar Malta”. That was 2 years ago and as any disillusioned Liberal Democrat will tell you, nothing’s changed. Nor will it if the government goes ahead with plans to let poorer regions hold down wages for public sector workers. Roll on the north-south divide. I say all this with both affection and dismay. I am a Londoner born and bred. But I have spent a large chunk of my career seeking nuance “beyond the Beltway” in the United States, searching for the “real” America as Republicans like to call the small towns scattered in the vast space between the Democratic-minded north-east, and the west coast. Now I am wondering, what and where is the “real”UK? Which is why I found myself in Newcastle-Under-Lyme on a wet Thursday evening watching a staggeringly good play. Where Have I Been All My life? 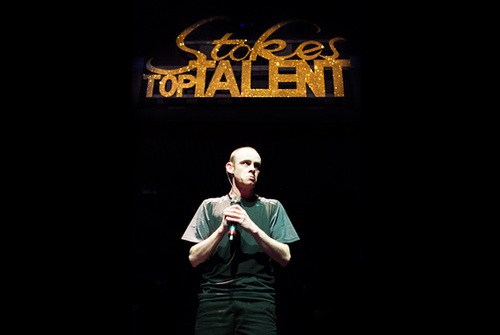 was about talent show contestants in Stoke-on-Trent. 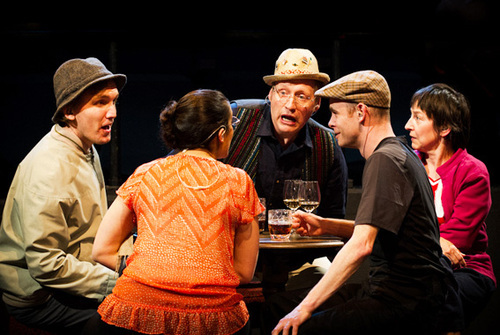 The characters were real people interviewed by playwright Alecky Blythe, who then edited the interviews and constructed a narrative. But the actors didn’t get a script: The interviews were played to them through earpieces during the performance and they spoke the words verbatim a second or so after hearing them. The result – hesitations, pauses, stumbles and all, was electrifying. Almost as electrifying was the discussion after the show with cast members, the director, and the Chief Executive of Stoke-on-Trent Council. The play was essentially about aspiration in a post-industrial city. What struck me in the conversation that followed was the pride and optimism about the region despite years of economic decline. There was passionate talk about various local regeneration projects and about how to attract the kind of investment that would produce up to 40,000 desperately needed jobs. Nobody suggested the government in London might have the answers. Come to think of it, nobody mentioned the government at all. Is that the “real”UK? I don’t know, but whether it’s Hackney or Humberside, Brent or BirminghamI’d like to try to find out.